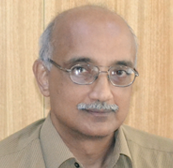 Dr. PrakashKeshaviah, B.Tech.-1967 in Mechanical Engineering from IIT Madras, and currently Director, Nephrology Unit, Himalayan Institute Hospital Trust& Hon. Prof. Physiology, Dehradun, Uttaranchal, has funded an “Institute Chair” at IIT Madras in the name of his Ph.D. advisor, Dr. Perry Blackshear. The Chair was officially announced on campus on August 27th at a small function presided over by the Director, Prof. BhaskarRamamurthi. A videotaped message from Dr. Blackshear was played on the occasion. At a later session, Dr. Keshaviah interacted with students and faculty involved in the interdisciplinary program on Biomedical Engineering. Dr. Keshaviah stated on the occasion, “This initiative on my part is about expressing gratitude and trying to give back in small measure for the wonderful education I received both at IIT Madras and at the University of Minnesota under Dr. Perry Blackshear. Prof. Blackshear was a wonderful mentor, giving me a lot of freedom to pursue my research, and encouraging me to go beyond the Master’s degree to a Ph.D. His informal approach, encouragement, hands-off mentorship and financial support were all invaluable in my development. I do not come from a privileged background but have succeeded in my life and career because of the excellent education I received. For that I am truly grateful”. Dr. Keshaviah was guided by his spiritual mentor, Swami Rama of the Himalayas, to take early retirement at the age of 53 in order to do honorary work at a charitable hospital he had established in rural Uttarakhand. His work there has been very varied and fulfilling, and has included setting up a dialysis and transplant program, teaching renal physiology and Yoga philosophy, financial administration, technical projects like smart classrooms, campus Wi Fi, solar schemes and rural water and sanitation projects. Prof. Blackshear is a pioneering biomedical researcher, recipient of many honors and a Professor Emeritus at the University of Minnesota. He is the inventor of a left ventricular assist device, first implantable drug infusion device, blood access for frequent dialysis and a non-blocking angioplasty balloon. At the age of 93, he still has a fertile mind with diverse on-going research interests. At IIT Madras, outstanding senior IITM faculty will be appointed to the recently-announced “Institute Chairs” in recognition of their exceptional performance and to provide ongoing motivation to excel and further their career development. This will, in turn, inspire younger faculty to aspire to greater heights.